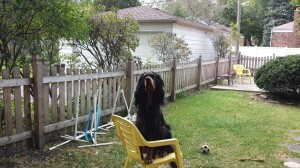 Here’s one of Rumi”s favorite places when he is in the back yard. He loves wedging himself in this chair which is no easy feat given his size and either napping or surveying the comings and goings of the neighborhood. He is particularly riveted by the birds and frequently attempts to catch them – so far unsuccessfully. I got him a toy that has a bird shaped fabric figure attached to a pole by a long elastic rope which he loves to chase and will trot around in circles with it in his mouth for long stretches of time. The dog sitter/walker was astounded when she looked out in the back yard and he was lying in the chair – she hadn’t seen a dog do that. Seems like he has watched me sit there and figured he would do so too. More photos coming later which will give you an idea of him standing or even perhaps in motion. It was nice to hear from you and the birthday wish for our pup. We named her Raven. The first pic. Is from our camping trip in Sept. The second pic. Is her and her sister Ember. Raven is on the left. Ember is 3 yrs. old. The third pic. Was from the summer up to no good of course. 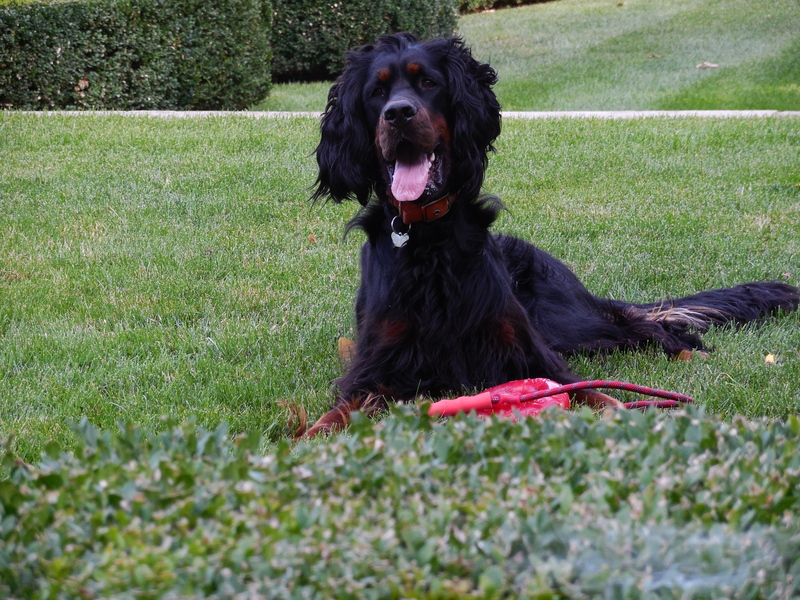 It’s been a while and maybe you wonder how all the pups are doing after about a year and a half….here’s our boy Doug having fun in the yard despite a very hot day. All is well here, happy, healthy and VERY much a guy who likes his toys, especially balls and things on a rope. He’s the best and thank you again! Just a quick note to let you know how Warner is getting along. It’s hard to believe Warner has been with us for over a month, but he’s already established himself as a member of the family. He had his second booster this morning and weighed in at just under 30lbs! He will definitely be a big boy. Thank you for sending the tag and bar codes, and hope all is well with you and yours. 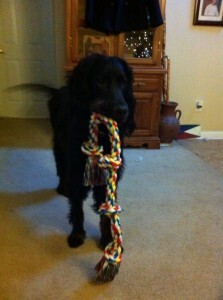 Here’s a picture of Archer with his new Christmas toy. He and BB love to play tug-of-war with it. I never seem to get a good photo of his face. His muzzle has gone almost completely black. But you can see how playful he is. His tail is always wagging and he’s always in some kind of trouble. This fact is very obvious because we just took another trip to the vet. He’d been limping since Christmas but didn’t seem to be in any pain. I guess BB barreled into him on Christmas morning and rolled him down our hill in the back yard. We thought he just strained his leg (which he did) from all of the rough-housing and partying. But he now has a broken toe on the same leg he broke earlier this year. He’s definitely a very spunky but trying dog. Neil had hoped to get him out into the field this winter but that will have to wait until everything heals. Hopefully, next year will be a better year for him.Wishing you a very happy New Year! Hi Martha, update on Rosie Martini, she is a doll and quite a handful. She knows some commands, sit, stay (not for a long time though), easy, come, bed time. She is the top dog, poor Charlie lets her get away with most everything. They love to play outside on our hill, chase and tug with sticks. She is 41 pounds, beautiful, and loves me to brush her, stands so proud. Does not like her front feet washed when she is muddy, still working on that. She is full of energy she and Charlie play all the time. Here is a Christmas picture of them both, they are watching me in the kitchen. Both are spoiled but a joy and so much company. Take care, and thanks again for our beautiful girl. They say a picture is worth a thousand words and our two children from your kennel teach us that every day. Martha, you came to our rescue when we suddenly lost our dog in April 2012…we were heart-broken and you gave us hope and Chet! I got one of the Martini Legace & Cluny puppies. I had the pleasure of picking him up. WOW was I impressed, one of the cleanest kennels I have ever seen, and I have seen a lot, and two of the nicest people you will ever meet. I also had the honor of meeting all of the adult Gordons, what a pleasure great dispositions, very friendly, beautiful and well behaved. 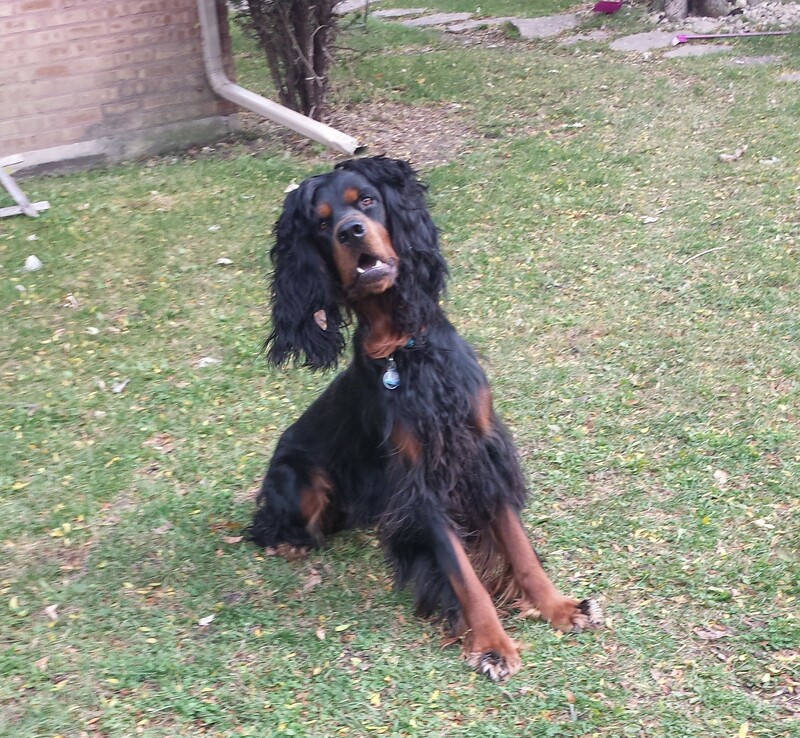 Update on 4/14/14: Hard to believe Einstein is 1 year old already. He is great, If there were 48 hours in a day he would be hugged 24 and play the other 24. He is still all puppy. As you can see he takes all the toys out, but never brings them back in. I collect them wash and put in basket, he takes one at a time out until he has them all outside. Gave him his big boy head and ears cut, he buried his head under my arm as I was trimming. I should have named him hoppy not only can he really jump, but does a great hop. Update on 9/14/14: Hard to believe Einstein is almost 1 1/2 years old. 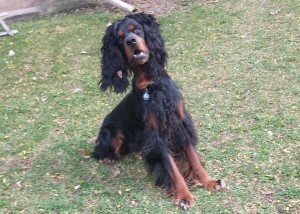 Great dog so loving, I get comments all the time on how beautiful he is. He is still all puppy all he wants to do is play. He points birds and sometimes fly’s if they have landed.